A natural arch, the Azure Window (which disintegrated earlier this year) hosted the wedding of Daenerys and Drogo. “Game of Thrones” has shot so much footage in Malta that you can even take a GOT bus tour of all the sites. April 24, 2017. For the nature lovers in the crowd, today I’ll be focusing on Malta’s alfresco options. The place is made for hiking, biking, swimming — and movie making. Whether you know it or not, you’ve probably seen some of the islands’ most stunning settings courtesy of ads, television, and films like Troy, The DaVinci Code, Captain Phillips, Gladiator, and too many to mention here. 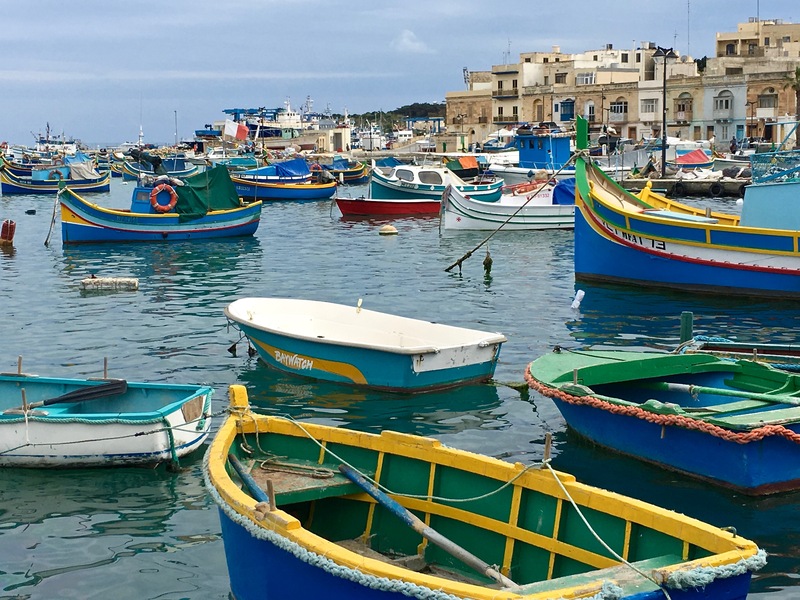 Marsaxlokk Bay offers a relaxing promenade along the harbor front of one of Malta’s oldest fishing villages, where you can take in the colorful scenery of the “luzzus” (fishing boats) or catch all the action of the Sunday fish market. The lure is the eerily azure waters set against a backdrop of rugged limestone cliffs and evocative ancient buildings that poke up out of the stark landscape. In places, the terrain feels so alien that you’ll wonder whether you’ve wandered into a stage set from Star Wars or some other sci-fi movie. But even if you’re not a camera buff or into into sporty stuff, you’ll still enjoy a walk along the shoreline for stage-set vistas that clear your mind and put everything into perspective. With our limited time and the unseasonably chilly Easter weather, Matthew and I barely scratched the surface of all the outdoor experiences Malta has to offer. But what we saw made us hanker for more, so take a look at our recommendations…. I opened this post with a photo (up top) of the now-collapsed Azure Window, a natural arch that sat in Dwera Bay until March of this year, when a tremendous storm washed it away. But just because the arch has bid Malta adieu doesn’t mean that there’s nothing more to see along this stretch of coastline. Matthew and I were knocked senseless by the view. A vast expanse of sand-colored stone spread out before us, like something out of Lawrence of Arabia. Cliffsides formed an imposing fortress that stood sentry over a barren, craggy beachfront where wind and water had tortured and twisted the rock into Dali-esque shapes. Harsh beauty. Talk about your lunar landscapes. These tidal pools made me feel like I was on the verge of breaking through the earth’s crust. Sturdy walking shoes area a must for hiking in the area, as the rough terrain can be a real ankle twister. Closer examination showed that petrified sand dollars made up much of the ground around us. 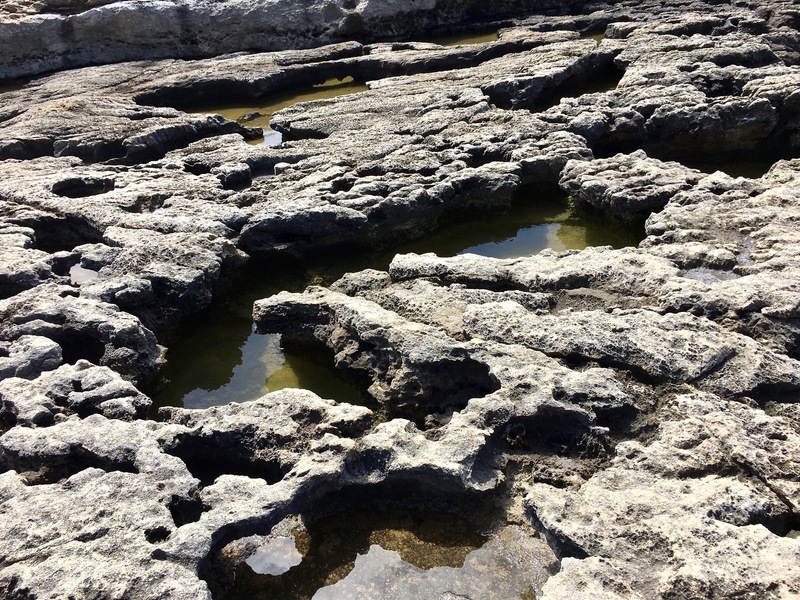 Here and there, little sulfurous-looking puddles marked the only signs of life — tidal pools filled with bits of seaweed and a few living relatives of the fossilized creatures frozen in stone nearby. A short walk across the beach led to an emerald green pond where divers bobbed in the water as they tested their equipment. 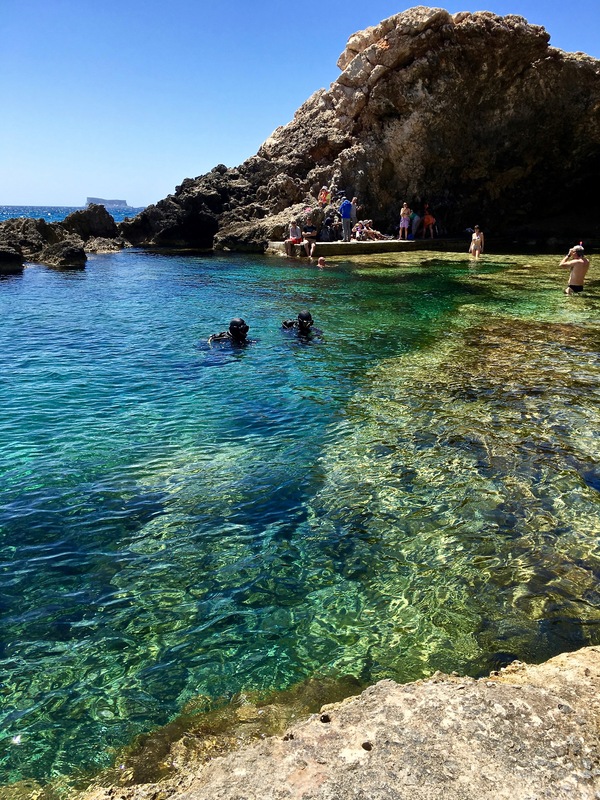 The pool is the entry point to “The Blue Hole,” a famous scuba spot next door to the Azure Window. Yep, Dwera has something for everybody, whether you want to “swim with the fishes” or just spend the day scrambling over the rocks and admiring the power of nature. Bonus, it’s on the island of Gozo, a short drive from the Ġgantija Prehistoric Temple Complex that I wrote about earlier. Check out these fossilized sea urchins (“sand dollars”). The rocky beachfront at Dwera is made up of critters that used to live on the ocean floor millions of years ago. Doesn’t the landscape look completely surreal, like a Dali painting where everything is melting? See the little outcropping of rock in the distance? Not the black rock, but the beige one with the grass toupee. It’s called Fungus Rock because it was the only spot where Malta Fungus once grew. The weird plant (not really a fungus) was discovered by the Knights Hospitallers, who used it to stop bleeding and cure dysentery. Dwera Tower, which was originally a watchtower, was converted into a guardroom to protect the Knight’s valuable medicinal stash. Around the bend from the remnants of the Azure Window, you’ll find “The Blue Hole.” You can swim in it, but it’s also a diver’s paradise, with access to an underwater cave. This green pool can be reached from the sea. The tunnel leads to “The Blue Hole” on the other side of the cliff. It’s actually a cave; part of the ceiling has now collapsed, so scuba divers love to make the underwater trek from one side of the cliff to the other. Rumor has it that during the trip, you’ll see parrotfish, moray eels, yellow coral, octopus, and more. At the launch point for accessing the Blue Hole, there’s a row of colorful boat shelters and a little café, in case you want to take a break from sightseeing. Although the day was a bit chilly, plenty of swimmers and scuba divers took advantage of the sunshine. In the distance, you can see cute little Fifla Island. 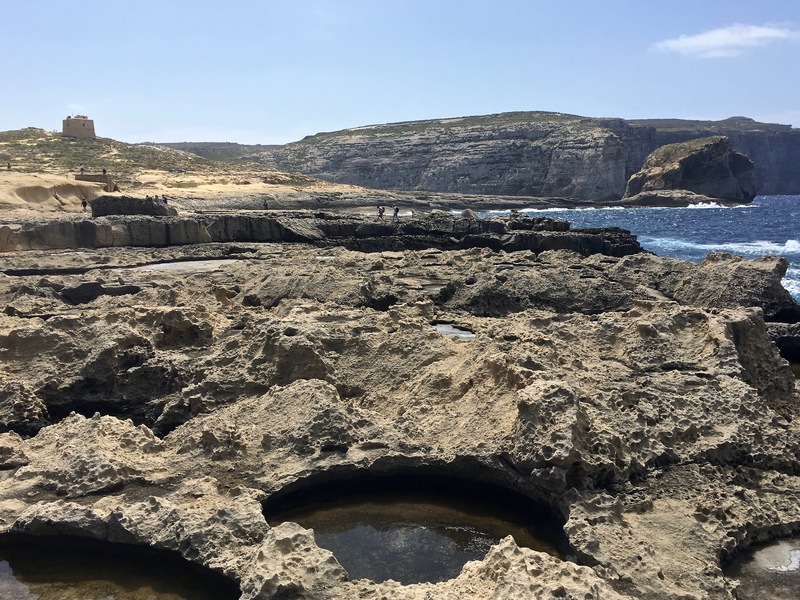 The day that we visited Ħaġar Qim and Mnajdra’s prehistoric temples, we took an hour to swing by Ghar Lapsi, the most picturesque swimmin’ hole you can imagine. Its dazzling blue-green waters are so clear that you can look down and see schools of fish cavorting along the sea floor. And for those of you who like to float without the fear of getting swamped by a rogue wave, a reef wall protects the natural cove from rough seas. Although Ghar Lapsi doesn’t have much of a beach, it does offer a concrete pier and a little spit of rock for sunbathing. Snorkelers and divers love the pool, too, as a great spot for spying rays, eels, and seahorses. Not to mention that there’s an excellent fish restaurant and bar right on site. Behold the vividly clear waters of Ghar Lapsi. You can see the little tiny slice of beach on the right, behind the rocks. Note how calm the water is, protected by the reef jetty. The terrace bar offered a fabulous octopus salad and a nice cold glass of local Cisk beer — yum! Wildflowers carpet the clifftop, and farmers have terraced the slopes below to capture rainwater and hold topsoil in place. As I’ve mentioned earlier, much of Malta is treeless, rocky, and quite arid. Freshwater is in short supply, so drinking water comes from reverse osmosis of seawater. But that doesn’t mean the islands are completely lacking in green. 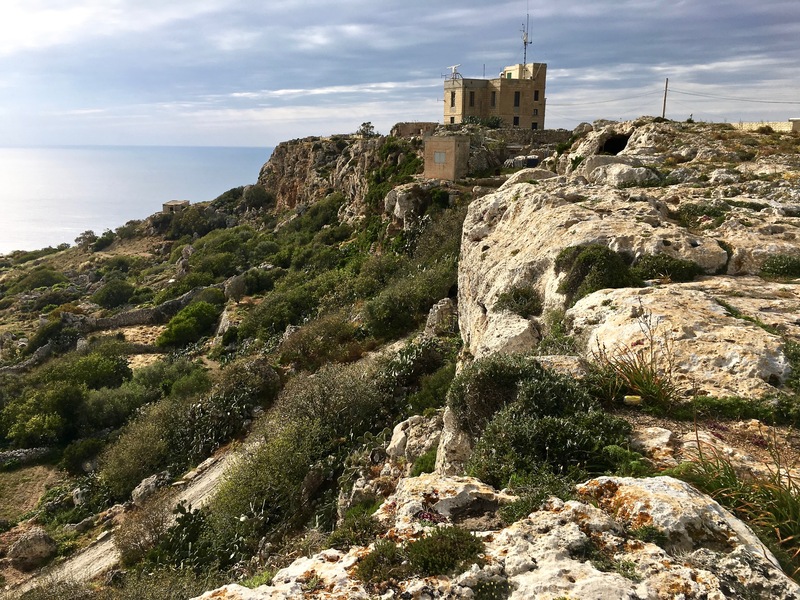 Places like the Dingli Cliffs are blanketed in a knee-high garden of wildflowers, herbs, and fragrant shrubs, collectively called garrigue. We visited late in the day, just before the sun set and as a storm was rolling in. Not an optimal time for a hike, but we made the most of it. 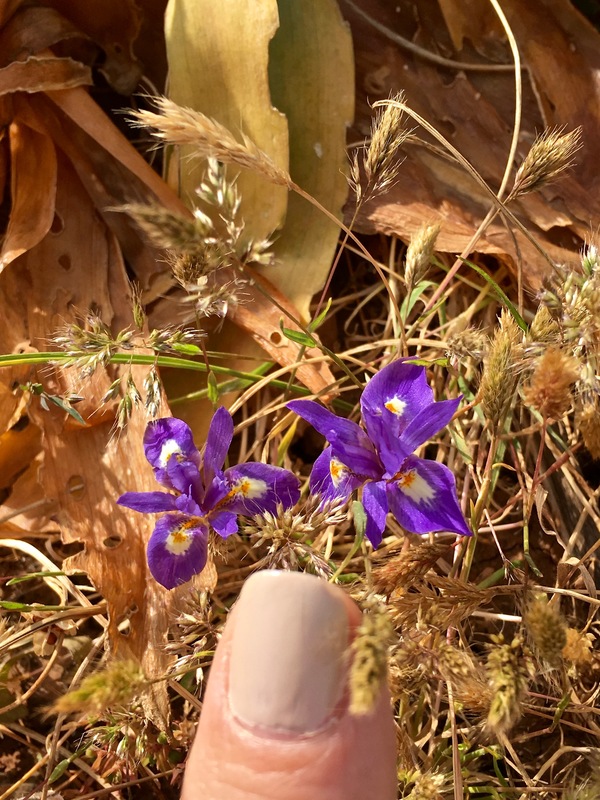 Yep, thumbnail-sized irises. Who would’ve thought there’d be enough water to support a plant that typically likes boggy soil? The cliffs themselves form the highest point on Malta, with an elevation of roughly 850 feet (250 meters) above sea level. A walking path treads the edge of the precipice, meant that, although it’s a level and easy trail, the wind can be pretty ferocious. As usual, Matthew tempted fate by posing on every frail-looking promontory, just to give me a thrill. Whereas I occupied my acrophobic self with examining the incredibly diverse carpet of tiny blossoms clinging to the rock face. Irises no bigger than my thumb and morning glories the size of quarters waved at me from their fragile perches. Guess they gotta be small and sturdy to survive the hot sun, high winds, and lack of topsoil and moisture here. A shift along the Maghlaq Fault line has given an upward tilt to the Dingli Cliffs and created a rift between the layers of limestone. From the Upper Coralline Limestone ledge, you can look down on the Lower Coralline layer blanketed with farmers’ fields. Tiny Fifla shimmers on the distant horizon. Red Stonecrop (Sedum rubens) is a heat-tolerant plant that can survive for months at a time without much water. Tiny Pink Bindweed — also called Morning Glory (Convovulus oleifolius) — is a threatened species on Malta, so you’ll have to resist the urge to pick a bouquet of wildflowers. Harness racing is big on Malta. During our hike, we watched trainers from a nearby stable exercising their horses. On another day, we passed by a bay and saw a trainer standing out in the ocean as two trotters on lead harnesses swam in a circle around him. Further along the trail, we ran into a herdsman with his flock, their bells all tinkling merrily. I’m testing my fear of heights here. So brave am I. BTW, in case you’re wondering, the name Dingli comes from Sir Thomas Dingley, the Knights Hospitaller who owned land in the area. Nope, it’s not a mirage. The Blue Grotto’s waters glow with an unearthly light. Click for a closeup view. 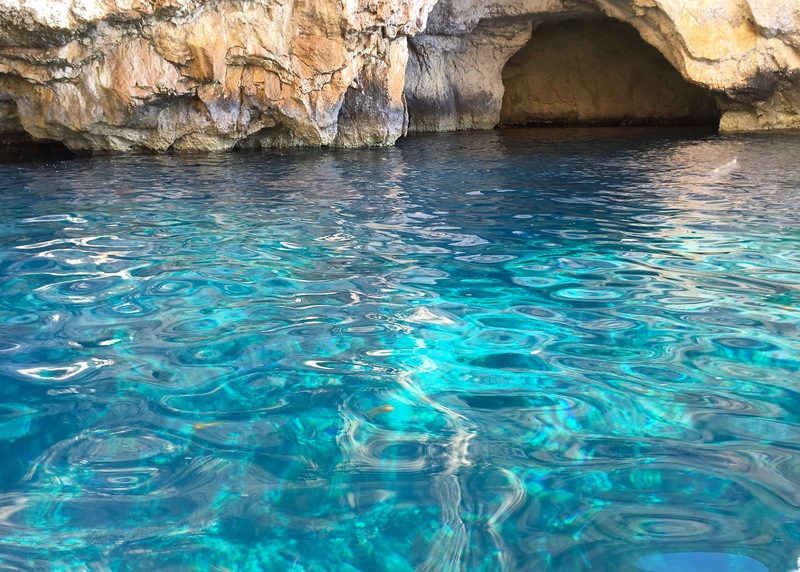 We’d read all about the famously glowing waters of The Blue Grotto. They supposedly owe their luminous quality to a combination of phosphorescent sea life and the location of the limestone caves themselves, which catch the morning light and mirror it back. We’d been warned that, to see the effect — and to avoid the rough seas that kick up in the afternoon — you must venture out early, before 1:00 p.m. So we heeded our guidebook’s advice and arrived in the tiny fishermen’s harbor of Wied iż-Żurrieq at about 8:30 a.m., just as the boats were being hauled into the water. Every night, the fishermen pull their boats out of the water and store them on shore. Then each morning, the men work together to roll the boats down the slipway and back into the water. Who said cats on board a boat are bad luck? You’ll catch your ride to the Blue Grotto from this tiny but picturesque harbor. It’s best to arrive early (9:00 a.m.) to ensure you get a seat. You might have to wait for more folks to arrive, but at least you’ll be ahead of the giant tour buses. A good motto, Mr. Kitty. Wished I could have mastered it before our trip. Look closely at the second boat, and you’ll see that it has an “evil eye” on the side, to scare away bad luck. 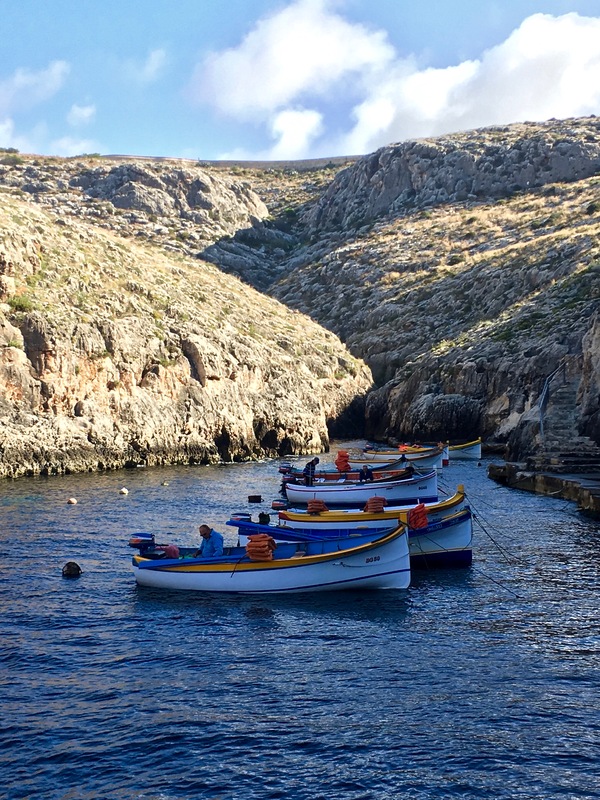 To get to the Blue Grotto, you’ll need to take a ride in one of these cute-but-itty-bitty fishing boats. The fishermen only make the trip weather permitting, as the seas are notoriously temperamental here. Call ahead the day before to check on conditions. The “excursion vessels” surprised me. Barely bigger than dinghies, they offered seating for maybe eight skinny people, including the fisherman himself. Each came equipped with a small outboard motor, but no oars, which would have seemed more fitting for such bathtub-sized boats. As I watched the ocean waves pound the shoreline, I noted that every vessel sported a single pole that skewered a stack of puny-looking life vests. I gulped and fingered the tab of Dramamine in my pocket, wondering if I should take it merely for the sedative effect. Despite all my years of bass fishing with my father, I’ve never really gotten over my fear of water or my predilection for seasickness. 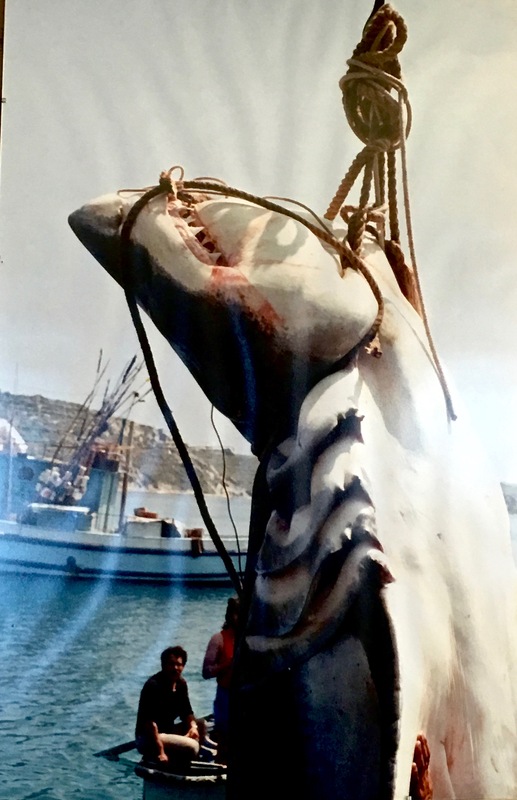 Photos of the Great White catch seem like an odd choice for wall décor when you’re hoping to encourage boating customers. But note the other signage. Perhaps the real goal is to sell more liquid courage before the outing. To distract ourselves while we waited for a full boatload of customers to arrive, we browsed the nearby souvenir stall and café. Big mistake. 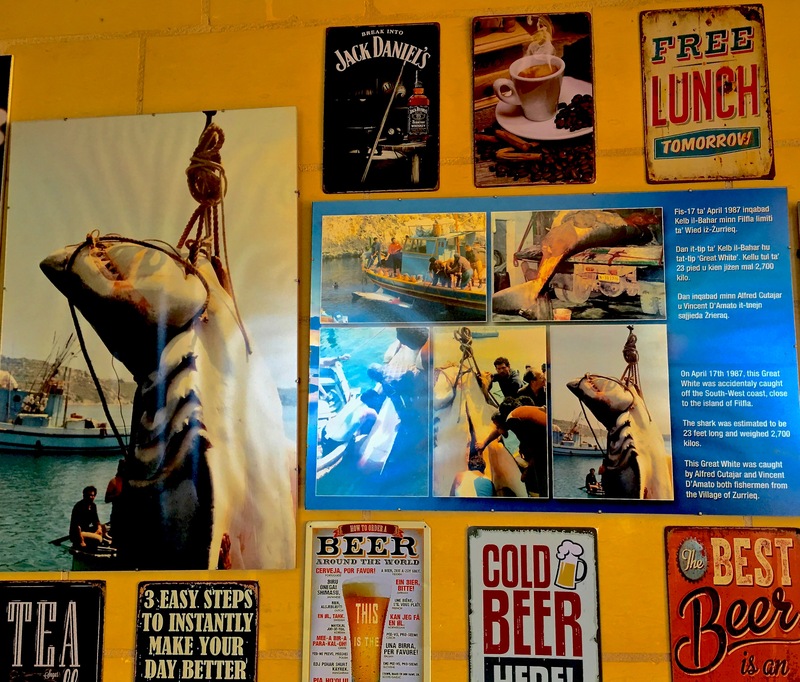 One wall of the place was plastered with posters telling the story of the Great White shark that had been caught just offshore. Photos of the toothy beast and vitals stats listing it at 23 feet long (7 meters) and 2,700 kilos (almost 6,000 pounds) weren’t terribly reassuring. Visions of our tiny dory being capsized by one of these behemoths made us both consider bailing on the entire idea. Notice the size of the shark when compared with the dingy in the background. No contest as to which one would win in a confrontation. We tried to console ourselves that it’d been 30 years since the shark’s capture, so maybe it was a one-of incident. But as we boarded the boat and the captain fired up his little mosquito of a motor, I couldn’t get the opening strains of the “Jaws” soundtrack out of my head. Taking note of the other passengers — an elderly German couple and a French family with a young boy — Matthew joked, “well, at least there’ll be some smaller, slower chum in the water; that’ll give us a chance to swim for it.” He always knows how to cheer me up. Lots of 16th-century watchtowers dot Malta’s clifftops. This one, called Sciuta Tower, dates to 1638. 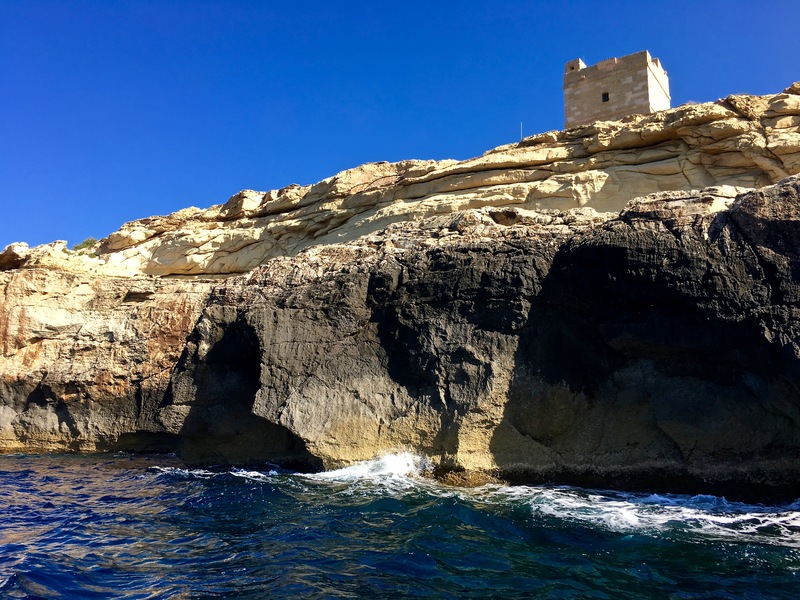 The Knights Hospitallers built these watchtowers as an early warning detection system against Barbary pirates, who often raided villages along the coastline. Our peapod of a vessel slowly chugged out of its sheltering inlet and into the buffeting wind. Tossing like flotsam atop the whitecaps, the little boat struggled to make headway, and few times I feared we might get swamped. To take my mind off our imminent death, I tried to focus on the unusual scenery surrounding us. Lumps of pockmarked limestone oozed out into the sea. In places, caves and natural arches perforated steep cliffs as a testimony to the sea’s sculpting talents. From this angle, the whole island looked like a termite mound of Goliath proportions. Every now and then, an ancient stone watchtower protruded up out of the landscape to put things back into human scale. Malta is made up of lots of limestone — the skeletal remains of algae, corals, and mollusks that fell to the bottom of the sea floor over time. The lumpy formation at Wied iż-Żurrieq (the launch point for Blue Grotto excursions) is known as the Lower Coralline Limestone layer and was laid down 35 million years ago. It’s pitted and tunneled almost like a termite mound, a result of weathering by saltwater and acid rain over the years. Look closely, and nestled in amongst all the limestone crenellations you’ll see Il-Kamra it-Tonda (the round room), a former WW II pillbox. In the distance is the tiny uninhabited island of Fifla, used for target practice by the British during their occupation of Malta. Today, it’s a nature preserve that hosts several protected plant and animal species, including the breeding grounds for three vulnerable and endangered bird species. Even from a distance, it’s easy to see the layers of limestone that were laid down on the ocean floor millions of years ago. Over time, seawater has etched several natural caves into the base of the cliff. 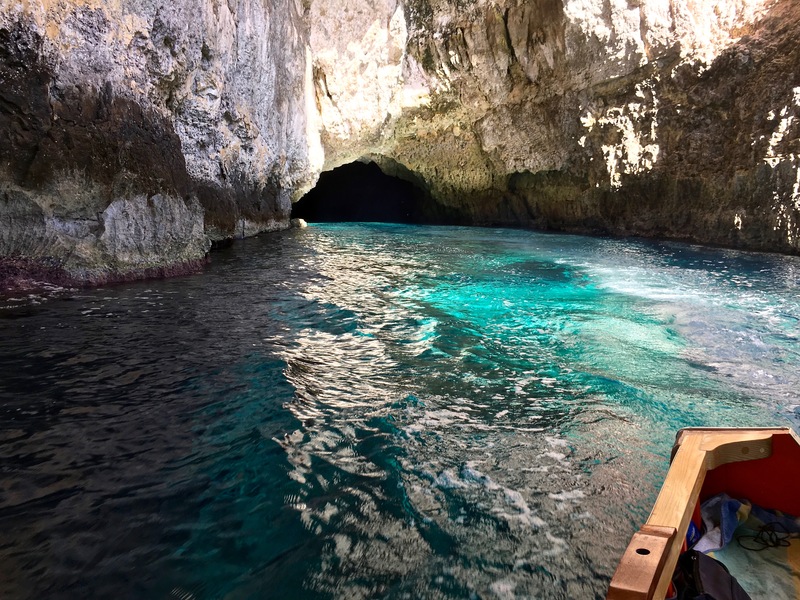 Together, this group of caves are collectively referred to as “The Blue Grotto,” although one particular cave nestled behind an arch bears the actual name. We’ll get to it in a sec. 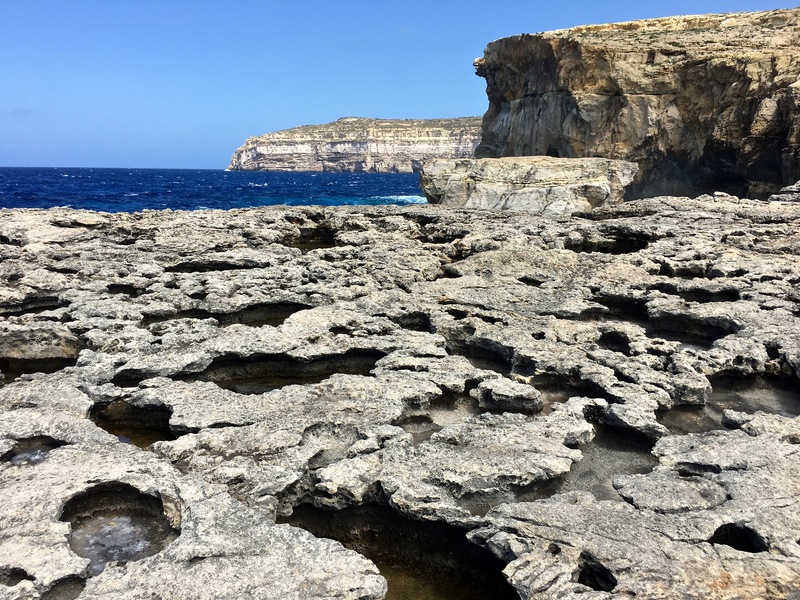 The limestone along Malta’s southern sea cliffs has eroded into some fantastic rock formations that include six grottoes with great names like Cats’ Cave and Temple Cave. Our captain clung to the coastline as we doggedly made our way towards a collection of shadows along the cliff face. “Cats’ Cave!” he called out, pointing to a depression in the rock face that, as legend says, was once home to a family of white cats. “Small Fifla Cave!” he yelled, nodding to a different opening that sported a rock formation shaped like the neighboring table-topped island. Both of these we passed by, due to the choppiness of the water. And frankly, I was fine with that, as all the crashing and splashing made me fully aware of why Blue Grotto trips often get cancelled, and why Malta offers a welcome harbor in the midst of notoriously rough seas. Yep, it really is that blue. Look closely, and you can see some orange jellyfish in the water. The sunshine here hits the white sandy sea floor (eroded limestone) and bounces back, which helps to amplify the blue hue and reflect the sky. But eventually we made it to one of the caverns large enough for the boat to safely negotiate. “Reflection Cave,” our captain announced, as we approached. The sun’s rays rendered the ocean floor an odd turquoise, like the bottom of a swimming pool. Purple encrustations of limpets lining the waterline along the cavern walls hinted at some of the phosphorescent sea life that contributes to the unearthly vibrant color. Once fully inside the dark recess, we watched the play of light against the ceiling and came to understand how the cave had earned its name. Heading into Reflection Cave, you can see the blue glow begin. As the sun enters the cave, the water turns a deeper cobalt blue. Look closely along the walls to see the line of purple where limpets have attached at the water’s edge. They feed on algae at night, some of which is bioluminescent and adds to the glowingly blue hue. Looking back on Reflection Cave, you can see the point where the darker, more jagged Lower Coralline Limestone changes to layers of smoother, sand-colored Globigerina Limestone. Its almost creamy-looking consistency comes from the fact that it’s mostly made up of the remains of planktons called “Globigerina forminifera,” a kind of microscopic crustacean. The cave interior totally reminds me of the 80s film, “The Abyss,” about an alien aquatic species living in the deep ocean. Supposedly the electric blue color of the water in these caves is enhanced by certain kinds of bioluminescent cyanobacteria (a blue-green, single-celled organism). 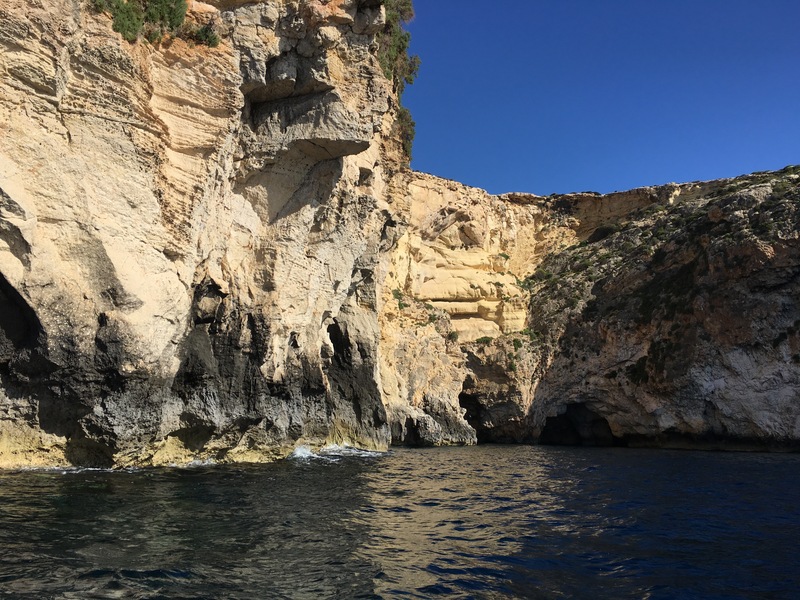 A short trip brought us to our next site, two natural arches, one of which soared high over our heads as we “threaded the needle” into the official Blue Grotto. Here, the water’s color changed to an oddly luminous teal. The mouth of the cave seem lit from below, and I had the feeling that something glowingly alien was about to rise up from the ocean’s depths. We sat suspended over the show for awhile, adjusting to the darkness and admiring how the light turned the rock walls into gleaming chunks of amethyst and malachite. With the plop-plop of water dripping from the cave ceiling, and the gentle lapping of waves against the walls, the experience was almost primordial. You can see one of two natural arches carved out by the action of the sea. These start as notches worn away by wave action. Weakness in the limestone allows water to break off chunks of the rock over time. These blocks continue to crash against the stone, wearing away its base until it crumbles. 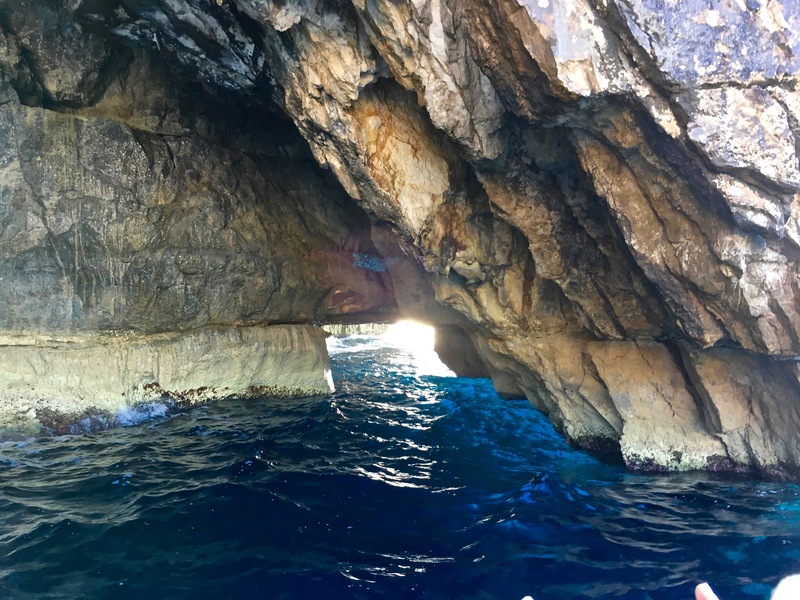 One of the features that helps create the dazzling color of the Blue Grotto is the fact that this arch encircles the entrance to the cave and helps create a pinhole effect for the entering sunlight. Leaving the cave, it felt as if we’d passed through a portal in time and entered into a scene from “The Lost World.” I fully expected to meet up with some dinosaurian form of sea life. Check out “The Blue Window,” a tiny square arch worn out of the stone. But of course, our last stop brought us to the bumpiest part of our cruise, Honeymoon Cave — so named for an island newlywed tradition involving a boat trip to the cavern for dinner on Picnic Ledge and a swim through the rectangular arch known as “The Blue Window.” Listening to the strong slap and surge of the surf here made me wonder how many marriages never made it past this moment. Leave it to me to think of worst-case scenarios in the middle of a romantic (though mildly terrifying) setting. I know it sounds like didn’t have a good time. And I’ll admit that I endured some stomach drops and heart palpitations. Check out my video here, and look for the priceless expression on my face. But the experience was totally worth it, despite my abject terror. 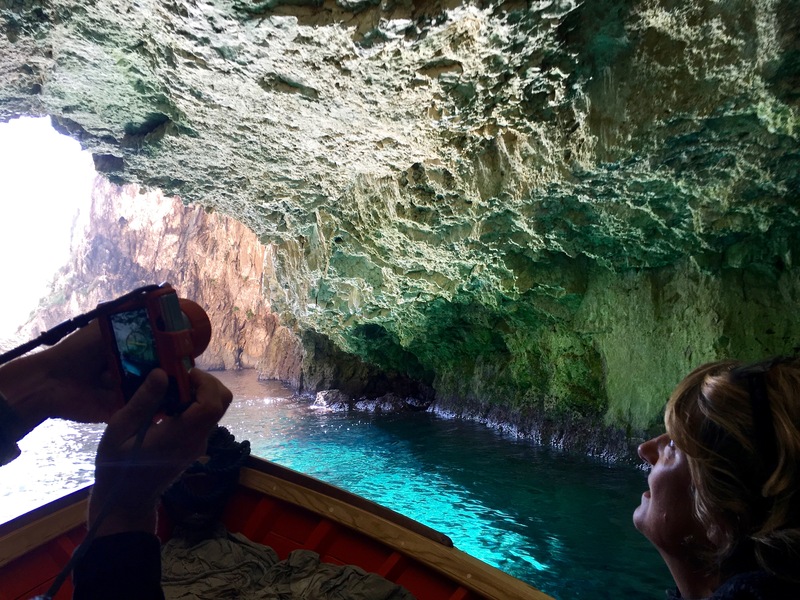 There’s an old adage that says danger enhances beauty, and the Blue Grotto trip proves the point. That’s all for now about Malta’s outdoor wonders — tomorrow, we’re on to travel tips. PS — A huge “thank you!” to my niece, McKenna, who edited the video and added music for me — you’re awesome! !